CD Innovation the manufacturer and supplier of Maestro, an advanced KNX Server / Gateway, is proud to announce the support of Alexa the intelligent and most popular personal assistant developed by Amazon. Now, users of Maestro Server will be capable of using KNX Alexa to control all systems and devices connected to Maestro. By using simple voice commands users will be able to instantly activate devices connected to Maestro e.g. Lights, Shades, HVAC, Irrigation Systems, Alarms etc’. 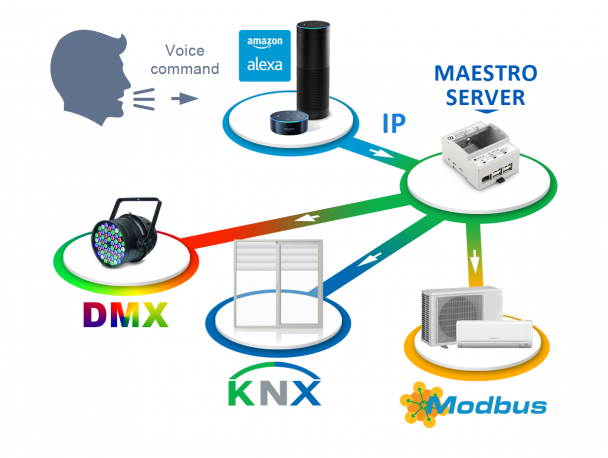 Maestro offers Alexa’s voice control not only to KNX but to all devices using it’s built in protocols such as Modbus, MQTT and DMX. Even devices using proprietary protocols supported by Maestro, like HVAC controllers and AV systems will now benefit from voice activation. More over; Maestro can translate Alexa’s commands to ASCII strings thus providing a gateway between Alexa to any external controllers capable of handling simple ASCII commands. Maestro provides a large number of different voice commands like very specific ones: “Alexa, dim the chandelier to 50 percent” or: “Alexa, set the temperature to 24”. But also group commands or a sequence of a number of actions: “Alexa turn on welcome Macro”. This new development adds up to a breadth of Maestro’s advanced and unique features emphasizing CD Innovation’s ongoing commitment for many years to the home and building automation markets and to its worldwide loyal customers everywhere.